As you all know, we started preschool…and we are in the afternoon program. At first I was super bummed about being in the afternoon, but then realized it was actually pretty awesome. You can read about why afternoon preschool is the bees knees here! But there is one massive, giant, horrific downfall to afternoon preschool. And that is SLEEP…or the ultimate lack thereof. Basically here’s the deal. If you send your kiddo to the afternoon program…you and he/she will no longer sleep. At all. Ever. Or at least that has been our experience thus far. I let him sleep in the car on the way home and woke him once we arrived. That ended with two hours of screaming and crying, followed by a cranky tired toddler who refused to fall asleep until 10pm (after 3 HOURS of us attempting to get him to settle down.) We ultimately had to rock him hysterically crying like a baby until he calmed down enough to lay down and finally admit defeat. I kept him awake in the car ride home. That ended with him in a miserable heap for the rest of the afternoon crying at EVERYTHING. The dog sniffed him – tears. He wanted to drink out of the OTHER cup – tears. He didn’t like what was for dinner – tears. He wanted to read a book we had returned to the library that morning – tears. The dog looked at him – tears. I suggested bedtime – tears. Tears, tears and more tired toddler tears. Oh, and bedtime yet again a 3 hour struggle culminating at 10 pm. I let him sleep in the car and continue to sleep once we got home. That ended with him waking up at 6:30pm screaming for his lunch? Obviously confused at what time of day it was and miserable. Yet again, he did not sleep until 10pm. Did I mention regardless of his late bedtime he still wakes at 6am (or earlier) like clockwork?! So as you can imagine, this means we have one very very beyond overtired toddler all day long. I finally reached out to both our pediatrician (to make sure I wasn’t damaging his poor little sleepless body and mind) and our preschool director (who is a brilliant brilliant woman who used to be a child psychologist) for HELP! The good news is he SHOULD adjust. We just don’t know how long that adjustment will take. Grr. And since we have a baby on the way this epic beyond overtired 3 hour bedtime battle needs to get under wraps ASAP. So we have a plan…or I should say we were prescribed a plan. I’m not entirely sure it will make a world of difference, but we have no other options at this point, so we are going to try it, because the alternative is not sustainable. 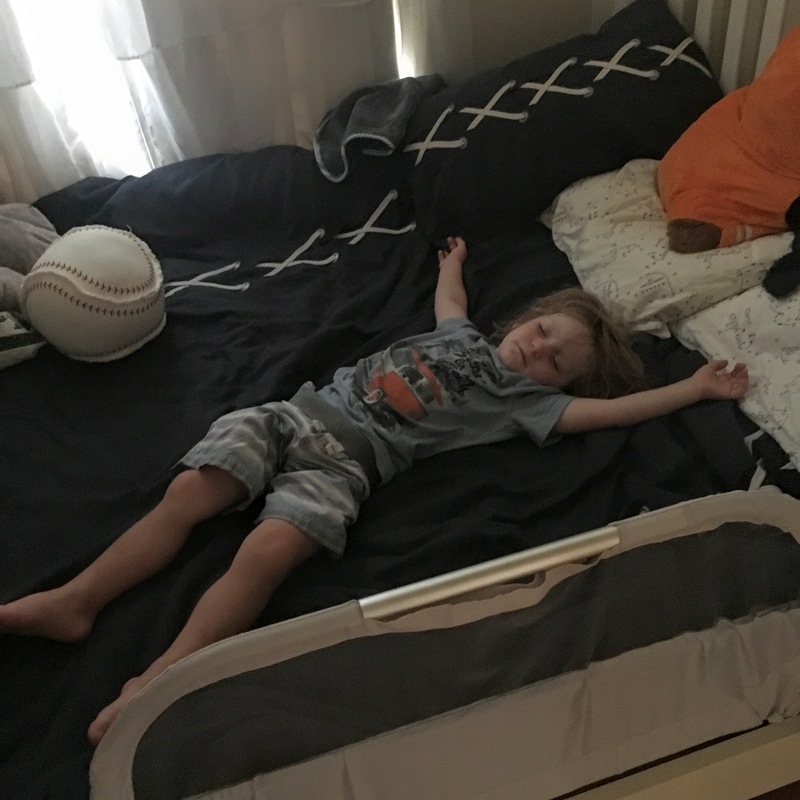 Here is the “plan” for sleep training (or attempting to sleep train) our toddler. First we need to find a week where both Micah and I can be home and ready to start the bedtime routine at 6:30 sharp NO MATTER WHAT. After looking at our schedules we selected this Wednesday as the start date. Until then, we are doing anything we can to get him to sleep! Even if he is screaming crying and clinging to our legs, we are supposed to pick him up and place him in bed. Even if he says he is thirsty, or he has to go potty, or he’s hungry…we are supposed to pick him up and place him in bed. We aren’t supposed to shut his door. Yep, you heard that right, we aren’t supposed to shut his door. No kiddie gate, nada. We want him to choose to be in his room in his bed and we are there to “help” him do it. Again. No idea if this will work. I envision Wednesday night being nothing short of torture for all three of us. BUT…i’m willing to try because if anything helps Avery actually get some well-needed sleep I’m all in. Wish us luck! Cause we are in for some loooooong stressful nights. I’ll be sure to update you guys on whether this plan actually works!! !